Perform real-time testing on a target computer and verify behavior against requirements. This example demonstrates testing a projector control system using model simulation and real-time execution on a target computer. The tests verify the controller against its requirements using test sequences that exercise the top-level controller model. The controller uses a push button input and a temperature sensor input, and outputs signals controlling the fan, fan speed, and projector lamp. This example uses Simulink® Real-Time™. 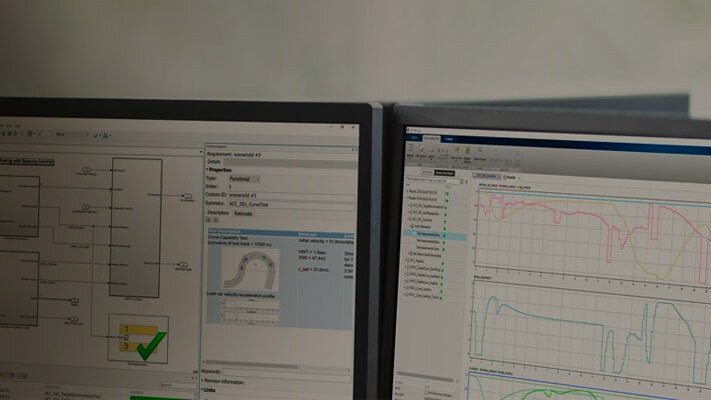 Before beginning, review the Simulink Real-Time system requirements. This example also uses a requirements document in Microsoft® Word format. The model, test harnesses, test sequences, and test suites link to functional requirements specified in sltestProjectorCtrlReqs.docx. Highlight requirements in the test harness and test sequence editor to view the linked items. Configure your target computer using the Simulink Real-Time Explorer. Connect to your target computer. If your target computer is not the default target, update Target Computer in each test case's System Under Test section. For more information on real-time configuration see the Simulink® Real-Time™ documentation. Run the model simulation test suite. After simulation completes, click the Results and Artifacts pane in the test manager. The controller does not operate in high-temperature or overheat mode, so the associated verify statements are untested. The controller passes the requirement that if the lamp is on, the fan is also on: verify_lamp_implies_fan. The controller passes the test that the system stays off if the on_off button is pressed when the temperature is above a limit: verify_sc4_on. The controller fails the test that the system shuts off if the on_off button is pressed when the temperature is above a limit: verify_sc4_off. Resolving this failure requires modifying the OnOff Check subsystem in the main model. For more information, see Assess Model Simulation Using verify Statements. Select the verify_sc4_off and verify_lamp_implies_fan results to visualize the verify statement results. The real-time test suite verifies that real-time execution results match model simulation results, and that the verify statements pass. The test harnesses log data using file scopes. Set the current working directory to a writable directory. In the test manager, run the real-time test suite. The Baseline Criteria Result section shows comparisons of real-time logged data to data captured from the model simulation. The results are identical. The Verify Statements section shows similar results to the model simulation.